In 2018, the city contained a total of 667 high-rise buildings, 187 skyscrapers and a further 28 under construction and 60 planned. making the city's skyline the tallest in Australia. The CBD is dominated by modern office buildings including the Rialto Towers (1986), built on the site of several grand classical Victorian buildings, two of which - the Rialto Building (1889) designed by William Pitt and the Winfield Building (1890) designed by Charles D'Ebro and Richard Speight - still remain today and more recently high-rise apartment buildings including Eureka Tower (2006), which is listed as the 13th tallest residential building in the world in January 2014. Melbourne is an international cultural centre and the city serves as Australia's cultural capital, with prominent offerings in the form of major events and festivals, drama, musicals, comedy, music, art, architecture, literature, film and television. The climate, waterfront location and nightlife make it one of the most vibrant destinations in Australia. For seven years in a row (as of 2017) it has held the top position in a survey by The Economist Intelligence Unit of the world's most liveable cities, partly due to its broad cultural offerings. The city celebrates a wide variety of annual cultural events and festivals of all types, including Australia's largest free community festival-Moomba, the Melbourne International Arts Festival, Melbourne International Film Festival, Melbourne International Comedy Festival and the Melbourne Fringe Festival. The culture of the city is an important drawcard for tourists, of which 2.7 million international and 8.9 million domestic travellers arrived in 2017. Melbourne has a highly diversified economy with particular strengths in finance, manufacturing, research, IT, education, logistics, transportation and tourism. Melbourne houses the headquarters of many of Australia's largest corporations, including five of the ten largest in the country (based on revenue), and five of the largest seven in the country (based on market capitalisation) (ANZ, BHP Billiton (the world's largest mining company), the National Australia Bank, CSL and Telstra, as well as such representative bodies and think tanks as the Business Council of Australia and the Australian Council of Trade Unions. Melbourne's suburbs also have the Head Offices of Wesfarmers companies Coles (including Liquorland), Bunnings, Target, K-Mart and Officeworks. The city is home to Australia's second busiest seaport, after Port Botany in Sydney. Melbourne Airport provides an entry point for national and international visitors, and is Australia's second busiest airport. Melbourne is also an important financial centre. In the 2017 Global Financial Centres Index, Melbourne was ranked as having the 21st most competitive financial centre in the world. Two of the big four banks, NAB and ANZ, are headquartered in Melbourne. The city has carved out a niche as Australia's leading centre for superannuation (pension) funds, with 40% of the total, and 65% of industry super-funds including the AU$109 billion-dollar Federal Government Future Fund. The city was rated 41st within the top 50 financial cities as surveyed by the MasterCard Worldwide Centers of Commerce Index (2008), second only to Sydney (12th) in Australia. Melbourne is Australia's second-largest industrial centre. It is the Australian base for a number of significant manufacturers including Boeing, truck-makers Kenworth and Iveco, Cadbury as well as Bombardier Transportation and Jayco, among many others. It is also home to a wide variety of other manufacturers, ranging from petrochemicals and pharmaceuticals to fashion garments, paper manufacturing and food processing. The south-eastern suburb of Scoresby is home to Nintendo's Australian headquarters. The city also boasts a research and development hub for Ford Australia, as well as a global design studio and technical centre for General Motors and Toyota respectively. After a trend of declining population density since World War II, the city has seen increased density in the inner and western suburbs, aided in part by Victorian Government planning, such as Postcode 3000 and Melbourne 2030, which have aimed to curtail urban sprawl. According to the Australian Bureau of Statistics as of June 2013, inner-city Melbourne had the highest population density, with 12,400 people per km2. Surrounding inner-city suburbs experienced an increase in population density between 2012 and 2013: Carlton (9,000 people per km2) and Fitzroy (7,900). As of 2017 RMIT University is ranked 17th in the world in art & design, and 28th in architecture. The Swinburne University of Technology, based in the inner-city Melbourne suburb of Hawthorn, is ranked 76th-100th in the world for physics by the Academic Ranking of World Universities, making Swinburne the only Australian university outside the Group of Eight to achieve a top 100 rating in a science discipline. Deakin University maintains two major campuses in Melbourne and Geelong, and is the third largest university in Victoria. In recent years, the number of international students at Melbourne's universities has risen rapidly, a result of an increasing number of places being made available to full fee paying students. Education in Melbourne is overseen by the Victorian Department of Education and Early Childhood Development (DEECD), whose role is to 'provide policy and planning advice for the delivery of education'. Three daily newspapers serve Melbourne: the Herald Sun (tabloid), The Age (formerly broadsheet, now compact) and The Australian (national broadsheet). Six free-to-air television stations service Greater Melbourne and Geelong: ABC Victoria, (ABV), SBS Victoria (SBS), Seven Melbourne (HSV), Nine Melbourne (GTV), Ten Melbourne (ATV), C31 Melbourne (MGV) - community television. Each station (excluding C31) broadcasts a primary channel and several multichannels. C31 is only broadcast from the transmitters at Mount Dandenong and South Yarra. Hybrid digital/print media companies such as Broadsheet and ThreeThousand are based in and primarily serve Melbourne. 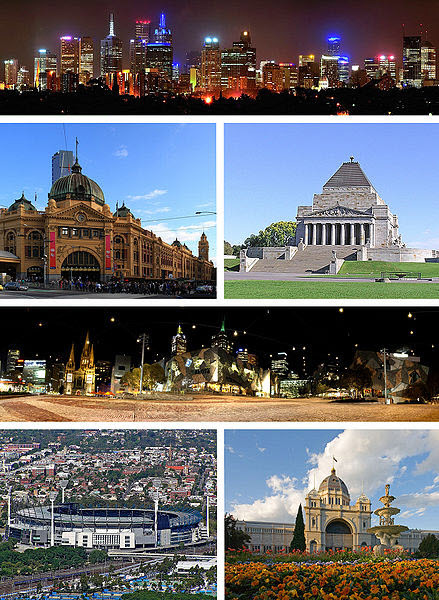 Melbourne has a wide range of religious faiths, the most widely held of which is Christianity. This is signified by the city's two large cathedrals-St Patrick's (Roman Catholic), and St Paul's (Anglican). Both were built in the Victorian era and are of considerable heritage significance as major landmarks of the city. In recent years, Greater Melbourne's irreligious community has grown to be one of the largest in Australia. The Melbourne rail network dates back to the 1850s gold rush era, and today consists of 218 suburban stations on 16 lines which radiate from the City Loop, a mostly-underground subway system around the CBD. Flinders Street station, Australia's busiest rail hub, serves the entire network, and remains a prominent Melbourne landmark and meeting place. The city has rail connections with regional Victorian cities, as well as direct interstate rail services which depart from Melbourne's other major rail terminus, Southern Cross station, in Docklands. The Overland to Adelaide departs twice a week, while the XPT to Sydney departs twice daily. In the 2013-2014 financial year, the Melbourne rail network recorded 232 million passenger trips, the highest in its history. Many rail lines, along with dedicated lines and rail yards are also used for freight. Melbourne's tram network dates from the 1880s land boom and, as of 2016, consists of 250 km (155.3 mi) of track, 487 trams, 25 routes, and 1,763 tram stops, making it the largest in the world. In 2013-2014, 176.9 million passenger trips were made by tram. Around 80 per cent of Melbourne's tram network shares road space with other vehicles, while the rest of the network is separated or are light rail routes. Melbourne's trams are recognised as iconic cultural assets and a tourist attraction. Heritage trams operate on the free City Circle route, intended for visitors to Melbourne, and heritage restaurant trams travel through the city and surrounding areas during the evening. Melbourne is currently building 50 new E Class trams with some already in service in 2014. The E Class trams are about 30 metres long and are superior to the C2 class tram of similar length. Melbourne's bus network consists of almost 300 routes which mainly service the outer suburbs and fill the gaps in the network between rail and tram services. 127.6 million passenger trips were recorded on Melbourne's buses in 2013-2014, an increase of 10.2 percent on the previous year. Water storage and supply for Melbourne is managed by Melbourne Water, which is owned by the Victorian Government. The organisation is also responsible for management of sewerage and the major water catchments in the region as well as the Wonthaggi desalination plant and North-South Pipeline. Water is stored in a series of reservoirs located within and outside the Greater Melbourne area. The largest dam, the Thomson River Dam, located in the Victorian Alps, is capable of holding around 60% of Melbourne's water capacity, while smaller dams such as the Upper Yarra Dam, Yan Yean Reservoir, and the Cardinia Reservoir carry secondary supplies. Although Melbourne's crime rate dropped 6.2% in 2017, it still experiences Victoria's highest crime rate with over 18,280 offences per 100,000 people. Despite this, Melbourne was ranked the 5th safest city in the world in The Economist's Safe Cities Index 2017.